Meanwhile, Alvaro Morata scored twice as Chelsea beat Nottingham Forest. Elliott List's late strike was enough to secure Gillingham's safe passage through to the FA Cup fourth round. 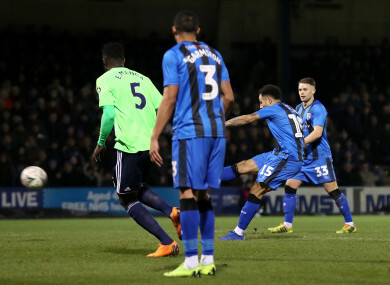 ELLIOTT LIST WILL no doubt go down in Gillingham folklore as his goal eight minutes from time was enough to see them knock Cardiff City out and progress to the fourth round of the FA Cup. Neil Warnock had hoped his team wouldn’t be the ones making the headlines against the League One outfit and named a strong starting line-up to go to Priestfield Stadium. The Welsh side had already endured a difficult start to 2019 after a 3-0 home defeat to Tottenham on New Year’s Day and will continue to look for a first win of the calendar year after List’s superb finish left Alex Smithies with no chance. Josh Murphy’s effort was cleared off the line as the game bled into the seventh minute of added time, but Cardiff were unable to prevent a 1-0 defeat and their exit from the FA Cup. Alvaro Morata scored twice during Chelsea’s routine 2-0 win over Nottingham Forest at Stamford Bridge, one which could well be Cesc Fabregas’s last in a blue shirt. The former Arsenal midfielder, who looks set to join Monaco in January, missed an early penalty but was instrumental in Maurizio Sarri’s side’s win over promotion-chasing Forest. Morata went into the game with three goals in his last nine games in all competitions and none in the league since his double against Crystal Palace at the beginning of November. Two goals in the space of 10 second-half minutes – as well as a dreadful miss from close range – ensured their defence of the cup would continue into the fourth round. Southampton squandered a two-goal lead to draw 2-2 with Derby County at Pride Park. Frank Lampard’s side showed good character to fight back after goals from Nathan Redmond gave the Premier League side a cushion heading into the final 40 minutes of the game. Jack Marriot and Tom Lawrence both netted in the space of three minutes either side of the hour mark to earn them a replay at St. Mary’s. Marco Silva placed his faith in a youthful Everton line-up as they ran out 2-1 winners over Lincoln City at Goodison Park. Ademola Lookman and Bernard got the goals for the home side inside 15 minutes as the Merseyside club raced into an early lead. Michael Bostwick pulled one back for the visitors on the half-hour mark but they couldn’t fashion another meaning their quest for another dazzling FA Cup run will have to wait until 2020. Elsewhere today, Bolton Wanderers came from a goal down to beat Walsall 5-2 at the University of Bolton Stadium. Accrington Stanley put Championship strugglers Ipswich Town to the sword as the League One side recorded a 1-0 win in front of their home fans. Swansea City exacted revenge for their league defeat last month as they finished 3-0 winners over fellow Championship side Aston Villa at Villa Park. Brentford were 1-0 winners at home to Oxford United , while Kwesi Appiah’s late strike handed AFC Wimbledon a 3-2 win away to Fleetwood Town. It took 48 minutes for Middlebrough to break Peterbrough’s resolve, but they eventually ran out 5-0 winners at the Riverside Stadium. To find the result’s of the rest of the day’s early action, click here. Email “League One side Gillingham shock Cardiff City, Derby fight-back earns replay against Southampton”. Feedback on “League One side Gillingham shock Cardiff City, Derby fight-back earns replay against Southampton”.